Khenchen Thrangu Rinpoche (Tib. ཁྲ་འགུ་རིན་པོ་ཆེ་, Wyl. khra 'gu rin po che) was born in Kham, Tibet in 1933. At the age of four he was formally recognized by His Holiness the Sixteenth Karmapa and Eleventh Tai Situpa as the ninth incarnation of the great Thrangu tulku, the abbot of Thrangu Monastery, whose root incarnation was Shüpu Palgyi Sengé, one of the twenty-five disciples of Guru Rinpoche. He began his formal studies at the age of seven and received full ordination at the age of twenty-three from the Sixteenth Karmapa. Following this, Thrangu Rinpoche engaged in a period of intense practice and retreat and received further teachings from one of his root teachers, Khenpo Gangshar. He was forced to flee to India in 1959, and consequently went to Rumtek Monastery in Sikkim, where the Karmapa has his seat in exile. He was the main teacher of the four principal Karma Kagyü tulkus of that time—the four regents of the Karmapa (Shamar Rinpoche, Tai Situ Rinpoche, Jamgon Kongtrul Rinpoche, and Gyaltsab Rinpoche). 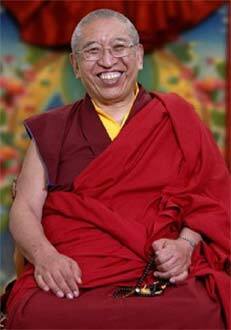 At the age of thirty-five he was given the degrees of Geshe Lharampa and Khenchen. Later, he was also appointed by His Holiness the Dalai Lama to be the personal tutor for His Holiness the Seventeenth Karmapa. In 1976 he began to teach in the West and became the abbot of Gampo Abbey—a Buddhist monastery in Nova Scotia, Canada—as well as to take charge of the three-year retreat centre at Samyé Ling in Scotland. He is a recognized master of Mahamudra meditation and has a special, direct transmission of the Shentong philosophical tradition. He is especially known for making complex teachings accessible to Western students. He is also the author of the widely studied The Practice of Tranquillity and Insight, a commentary on the eighth chapter of Jamgön Kongtrul’s Treasury of Knowledge, on shamatha and vipashyana. Khenchen Thrangu Rinpoche is the author of 45 Dharma books in English, below are just a few. For a complete list, you can visit his website below.